If your horse needs diagnostics or treatments that your regular vet is unable to offer, your vet may offer you a referral to Canberra Equine Hospital. At Canberra Equine Hospital, you have access to expert advice, diagnostics and treatment options for any condition affecting your horse. These include surgical, medical, dental, soundness, reproductive, heart and eye issues. If your regular vet has given you a referral, we will keep in regular contact with them. So they can continue with follow up care and treatments, your vet will be sent a full medical report of treatments your horse has received. Should your horse need surgery of any kind, Dr. Mark Ethell is our on-site specialist equine surgeon. 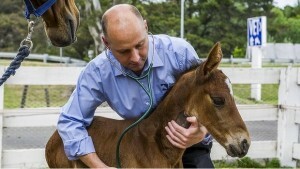 Mark is the only Board-Certified Large Animal Veterinary Surgeon in the ACT and surrounds. With advanced qualifications in equine dentistry, Dr. Rebecca Walshe is capable of many forms of oral surgery and routine dental care for your horse. Rebecca is a Member of the Australian College of Veterinary Scientists (Equine Dentistry). Dr. Suzanne Polak has special interests in equine podiatry and musculoskeletal issues. Suzanne has completed a postgraduate Diploma of Animal Biomechanical Medicine. She has developed effective techniques for treating biomechanical issues in all types of horses. For specialist eye consultations, we have regular visits from veterinary ophthalmologists. Your horse may be given a referral from your regular vet to see Dr. Cameron Whittaker or Dr. Jeff Smith. Our team of vets and consultants cover every aspect of equine veterinary care. We strive to provide superior service and advice. Our vets place high importance on remaining at the forefront of what veterinary medicine has to offer, so they participate in regular continuing veterinary education. We routinely communicate with colleagues from all over the world when dealing with complicated cases, ensuring the best outcome possible for every patient. Remember, you do not need a referral from your regular vet to access any of these services. Call us on (02) 6241 8888 to arrange an appointment.